Having your pet properly prepared for a blood test helps to ensure that the results are as accurate and reliable as possible. Sometimes test results are abnormal only because the pet was not properly prepared. If your veterinarian suspects the results are unreliable, you may need to have the blood tests repeated. Is preparation the same for all blood tests? No. Blood tests can be grouped as routine testsand special tests. Preparation for these two types of tests is slightly different. Routine testing provides an overview of an animal’s health and is done in both healthy pets (See articles on “Wellness Testing”) and sick pets (See articles on Complete Blood Count and Biochemistry Profile). Any visit to the veterinarian could include a routine blood test. By having your pet properly prepared for each visit, you may save valuable time and money by reducing the need for repeat testing. Special tests are done to investigate or monitor a specific problem. For example, the veterinarian might want to monitor the blood sugar level in a diabetic pet, or to test for drug levels in pet on medication. Proper preparation for “special” tests is essential for accurate results. 1. 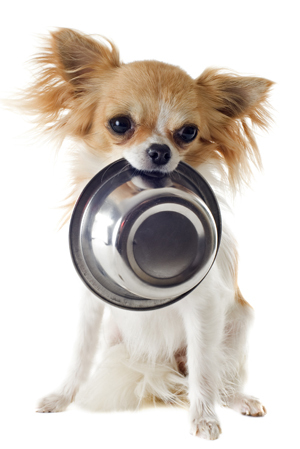 Gentle fasting: If possible, do not feed your pet for about 6 hours before your appointment. Fasting helps to clear the blood of lipemia, fat droplets that appear after eating. Lipemia can interfere with some blood tests and make the results difficult to interpret. 2. Keep water available: This is especially important in warm weather. Even mild dehydration may change the test results, so be sure your pet has access to water before your visit to the veterinarian. 3. Avoid exercise and active play just prior to your visit: Physical activity can cause changes in test results, so exercise and active play should be avoided. Dogs: Keep your dog on a leash at all times. This makes it less likely your pet will be frightened or upset by other animals in the waiting room. Cats: Bring your cat in a cat carrier. This helps your pet feel more secure and eliminates the risk of escape. Handle your pet calmly and quietly - talking in a soothing voice may help to distract your pet and reduce anxiety. If the waiting room is crowded, you may wish to let your pet wait in the car (weather permitting) to reduce excitement. If your pet is highly excitable and the veterinarian is concerned this may affect blood test results, your appointment may be booked at a separate time when the clinic is quieter. This may reduce the stress associated with taking a blood sample. How do I prepare my pet for a "special" blood test? The preparation for a special blood test depends on the test. Fast your pet strictly for 12 hours or more. Give medication at a specific time before your visit – e.g. if you are asked to give medication 4 to 6 hours before the appointment, you may need to change what time you give your pet his regular dose. Withhold medication before the blood sample is taken - e.g. Follow the instruction “Do not give medication after 7:00 a.m. on the day of your next visit” even if it means delaying or skipping a dose. Your veterinarian will give you specific instructions before your appointment (See “Special preparation for your pet's next visit” below.) It is important that you follow these instructions exactly to ensure accurate test results.